Most Millennials tend to greatly underestimate the amount they will need for a down payment. The national average down payment amount is about $25,000, but 30% of Canadian Millennials have less than $10,000 in savings, and 10% have no savings at all. 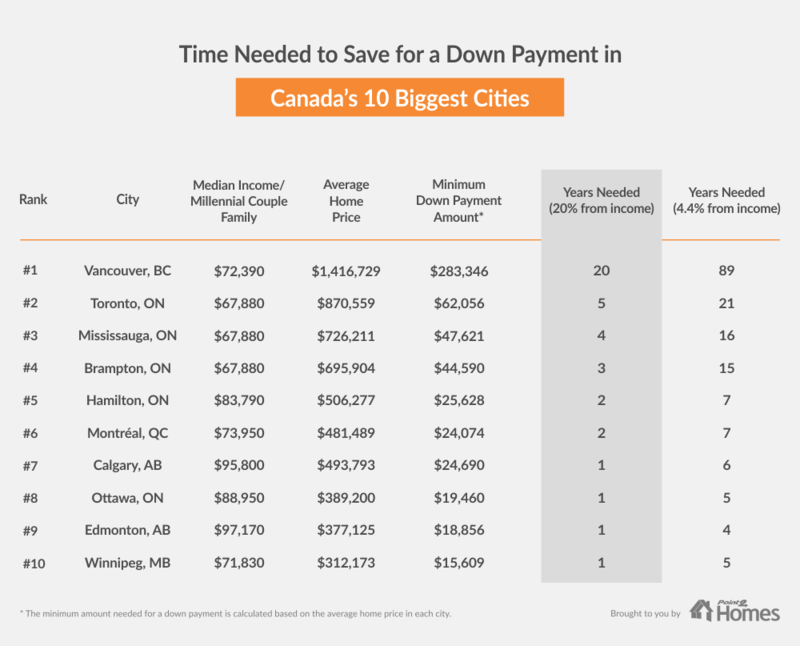 In Canada’s 10 most populous cities, the time needed to save for a down payment varies significantly: from 20 years in Vancouver, to 4.6 in Toronto, and as little as 1 year in Edmonton. In the nation’s seven most expensive markets, Millennials will need between 14 and 35 years to save for a down payment, making these urban centres the most unattainable for the young demographic: West Vancouver, BC; Vancouver, BC; North Vancouver, BC; Burnaby, BC; Oakville, ON; Richmond Hill, ON; and Richmond, BC. In 40 Canadian cities, Millennials could save for a down payment in 12 months or less, which makes these markets the most attainable for Gen Y-ers. In a nationwide survey of over 9,000 prospective homebuyers carried out on its platform, Point2 Homes found that 66% of the Millennials interested in purchasing a home would like to do so within one year. However, almost half (49%) of the survey-takers aged between 25 and 38 years old have savings significantly under the national average down payment amount, which is $25,000. Moreover, some of the Millennials in the survey state that they haven’t managed to set aside anything at all, meaning that the desire to buy a home might be in conflict with Gen Y’s budgetary realities. 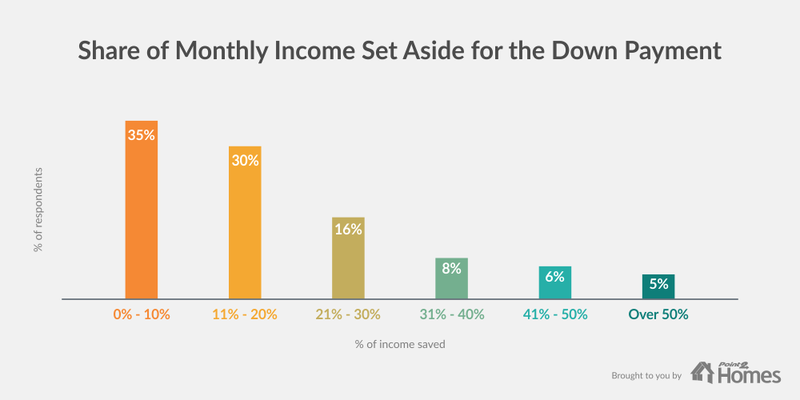 35% of Millennials state that they set aside less than 10% of their income each month and 30% of respondents only save between 10% and 20%; a small minority (5%) are very thrifty and manage to survive on a small budget, saving over half their income. It might be that sometimes, the sacrifices Millennials could make in order to save faster are considered too big. Skipping vacations for a year, getting a second job, and lowering general expenses is not that easy when opportunities for consumption and entertainment abound. But even if they are thinking about starter homes and condos, certain financial restrictions are still necessary if they want to meet their goal. And when it comes to actual amounts, the majority of young people who wish to eventually own a home do not yet meet the minimum requirements. Given that the down payment is the first hurdle on the road to home ownership, saving enough money is the natural first step. 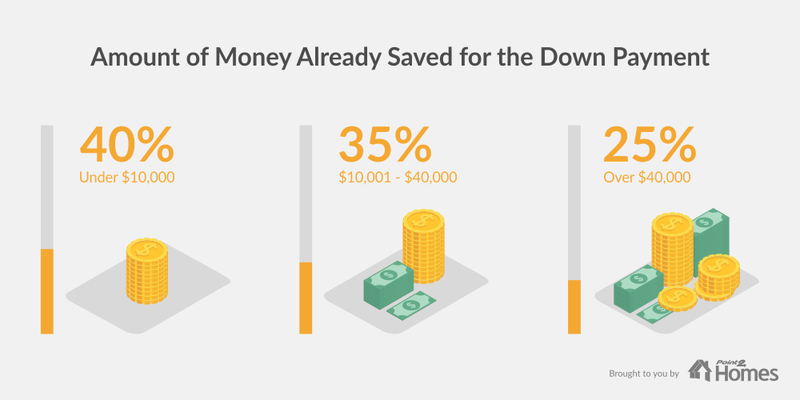 However, 40% of Millennials had saved less than $10,000 at the time they took the survey, which is not even half the national average down payment amount. And if we zoom in to city level, it becomes apparent that home ownership can go all the way from being an achievable goal to looking like a dream deferred indefinitely. Millennials hoping to purchase property in Vancouver, Toronto, Mississauga, and Calgary tend to grossly underestimate the down payment amount they will need. Given the current median income of a Millennial couple and the local average home price, Vancouver is out of reach for young people. Toronto, Mississauga and Brampton are much more attainable for Millennials trying to save for a down payment, while Edmonton, Ottawa, and Winnipeg have the lowest saving time of all the big cities. The contrast between how much money Millennials think they will need and the actual down payment amount is striking in several cities. 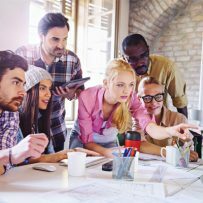 In some of the most popular and most expensive business hubs in the nation, most Millennials are in for a big surprise. 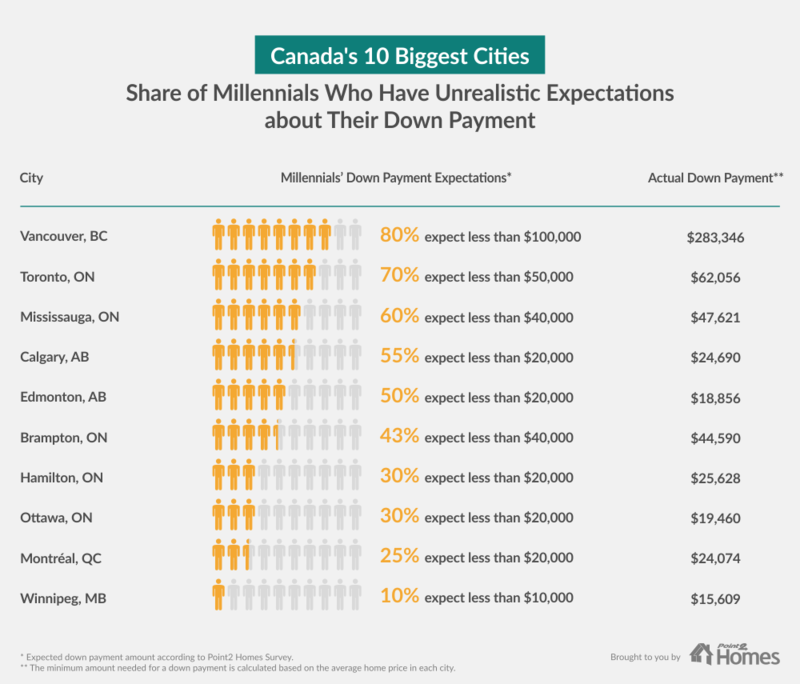 Although the minimum down payment is close to $300,000 in Vancouver, 80% of the Millennial respondents believe they will need under $100,000. There is also a large gap between expectations and reality in Toronto: here, the average down payment is a little over $62,000, but 70% of Millennials estimate they will need under $50,000. In other urban hubs, there are smaller discrepancies between how much money Millennials think they need, the amount they actually need, and how much they have in savings. However, even in cities like Calgary, Edmonton or Mississauga, a significant percentage of young home seekers are expecting significantly lower down payments. This means one of two possibilities might be true: either Millennials are counting on their parents for help when they take the step towards homeownership, or their unrealistic expectations will set them up for a rude awakening when reality hits. The down payment requirements in the nation’s biggest cities vary considerably. This means buying property in some of these real estate markets is somewhat attainable, while other markets are highly unattainable for Millennials. Vancouver, the eighth-most populous city in the country, is the harshest on its aspiring home owners: young people who want to settle down here are looking at almost 20 years’ worth of savings, assuming they can set aside 20% of their income after paying the rent and covering other necessities in this expensive Pacific metropolis. The other big urban centres don’t come even close to this overwhelming time span. Toronto might also discourage a fair share of Millennials attempting to find their dream home in this city, but it is more than accessible by comparison: in Canada’s largest business centre, it would take four and a half years to save for a down payment. Mississauga and Brampton, ON, follow suit, with a more encouraging three-and-a-half years. Edmonton, AB (11 months), Winnipeg, MB (13 months) and Ottawa, ON (13 months), close this ranking with an even more positive outlook for prospective young homebuyers. Millennials would need between 14 and 35 years to save for a down payment in these seven markets: West Vancouver, BC, Vancouver, BC, North Vancouver, BC, Burnaby, BC, Oakville, OK, Richmond Hill, ON, and Richmond, BC. West Vancouver boasts the most outrageous average home price of all the urban centres we analyzed, but these seven highly-unattainable real estate markets all crossed the $1 million mark. Oakville and Richmond Hill, ON have two of the lowest incomes per Millennial household in all of Canada. Many Millennials would like to one day own a home in the city they love. But if that city happens to be Vancouver, they probably already know their homeownership dream is more like a fairy tale: enjoyable to think and talk about but ultimately unrealistic. Vancouver, however, is not the only urban hub that is totally out of reach for people in their mid-twenties to mid-thirties: according to our analysis, there are seven markets where it is virtually impossible for a Millennial couple to save for a down payment. Taking into consideration the average home prices and the average household income of Millennials living and working in Canada’s most expensive urban centres, it would take young people in these places a depressingly long time to save for a down payment. And even this would only be possible if Millennials religiously set aside 20% of their income each month. Moreover, given the recently introduced mortgage stress test, along with other measures aimed at cooling the Canadian real estate market, Millennials might not meet the credit standards and debt-to-income requirements necessary to qualify for a mortgage, even if they do have the money for the down payment. West Vancouver, one of Canada’s wealthiest municipalities, boasts average home prices well over $2.5 million. This amount puts West Vancouver in a league of its own, since the down payment alone could actually buy you a home in 64 of Canada’s biggest urban centres. The second most expensive market in Canada, Vancouver, saw its average home price settle at a little under $1.5 million in June. The other five real estate markets, three of them in BC (North Vancouver, Burnaby, and Richmond) and two in Ontario (Oakville and Richmond Hill) all have prices that hover around the $1 million mark. But things could be worse. Considering that Canadians only manage to save, on average, 4.4% of their income per month, the numbers look simply comical (or tragic, depending on your perspective and sense of humour). 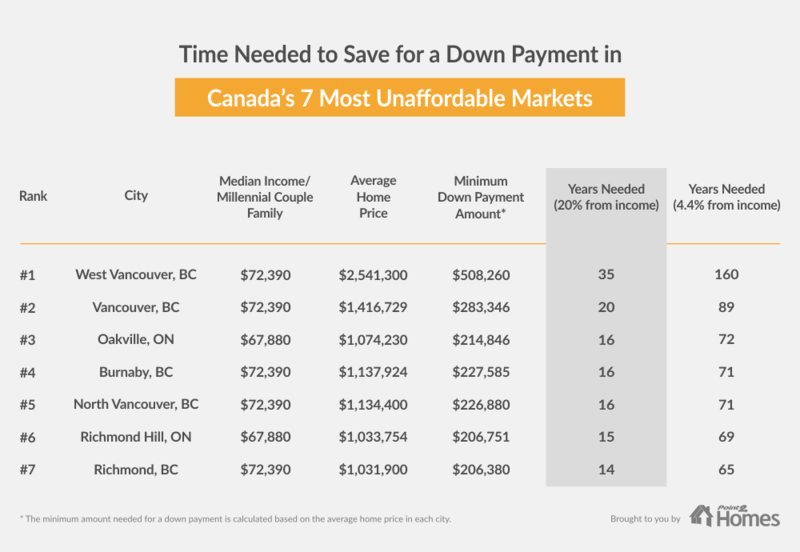 Under these conditions, it would take people in Richmond, BC (the least expensive of the seven) 65 years to save for a down payment, and no less than 160 years if they chose to settle down in West Vancouver. These absurd numbers suggest that something has to give in the Greater Vancouver property markets. Although a lower income is to be expected considering the age and professional experience of this demographic, people still want to become financially independent, move out of their parents’ house and buy their own when they’re in their 20s or early 30s. This feat seems to be the most challenging in Oakville and Richmond Hill, ON, where the average income per household is $67,880. This means two of the seven urban centres with the highest home prices are also among the top three places where Millennials have the lowest salaries in all of Canada (Cornwall, ON, is at the bottom of the list, with an average income of $65,250 for people aged between 25 and 38 years old). In fact, many of the cities surrounding the Ontario capital, Toronto included, have a similar median income ($67,880), but it’s the diverse home prices that make the difference: while both Oakville and Richmond Hill have crossed the $1 million threshold, meaning a Millennial would need over 15 years to save for a down payment, in Mississauga it is possible to save for your entire down payment in three and a half years, provided of course 20% of your income is set aside. Timmins, ON, is the most Millennial-friendly city of all the urban centres included in our analysis when it comes to homeownership opportunities. Here, a Millennial couple could afford their down payment in just five months. Trois-Rivières, QC, and Cape Breton, NS, follow suit, with only six months needed to save for a down payment. Edmonton, AB, and Québec City, QC, are two of the most populous and most affordable cities for Millennials, with saving time frames of 12 and 10 months respectively.